Customizing mugs to suit your individual needs. Printed mugs are a popular choice for promotional merchandising. Using customized printed mugs is a great way to increase brand promotion, and the universal practicality and cost-effective nature of this particular item makes mugs stand out amongst other promotional products. With the wide range of styles, colors, sizes, and designs now available in both mugs and prints, customizing mugs to suit your individual needs is now easier than ever. (1) What are the printed mugs going to be used for? In the home, at the office, etc. This could determine the style or size of mug most suitable. At Global Promo we offer a wide range of mug styles, from stylish printed coffee mugs, glass etched mugs, to stainless steel travel mugs. (2) Who are the printed mugs going to be used by? Employees, families, students, traveling employees, etc. This will also influence the best choice of mug for you. For example, the stainless steel travel mugs would certainly be suitable for the traveling employee, home-maker, or student. On the other hand, our Maxwell Williams range is a perfect choice for at-home use, coming in a variety of modern designs and colors. For corporate use, you could also opt for a sturdy large coffee mug size having the capacity for larger coffees or even soups making it a great choice for employees in the office working long hours and which will also have more space for logo advertisement. (3) What type of mug is going to be best for the print you are using? For example, a large logo will need a large and flat surface area, whereas a small brand name line could be just as effective printed on smaller coffee mugs with curved surfaces. (4) What mug colors will be best for your logo advertisement? A black logo will stand out most on a white background, however a range of other lighter colors would also suit. 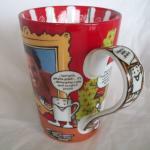 Likewise, a brightly colored logo will certainly look more striking on a white ceramic mug. However, using a white print would mean that you could choose from a range of background colors, whilst making sure that they are dark enough to make the logo stand out. As you can see, there exists a range of choices and many possibilities when customizing printed mugs, all of which need to be considered purposively when choosing the style, size and color of mug which best suits your individual objectives. What is most important will depend on where and by whom the mug is going to be used and of course that the print on the mug is going to be as eye-catching as possible in order to attract attention -amongst all the other mugs out there! For more advice on how to customize your own printed mugs please call the helpful staff at Global Promo!